The Country Director of World Cocoa Foundation has urged government ‘walk the talk’ on its assurances to increase local cocoa processing. Vincent Frimpong Manu also urged local cocoa processing companies, ordinary members of the public and civil society groups working in the cocoa industry to do their part to make the plan to increase local cocoa production a reality. “We need to process a lot more of our chocolate in Ghana. But we need good policies and we need to have the capacity to process. We need to have the machines. We need to have the market,” Mr Frimpong Manu noted. Ghana exports the majority of its cocoa to Europe and America at premium prices and processes less than 30 percent of it locally. Some of the local processing companies have repeatedly complained about the unavailability of the beans and sometimes import the produce from neighbouring Ivory Coast to keep their plants running. “Government must ensure local processing companies get the needed cocoa beans to process. Government must not only make assurances and not provide the companies with the beans. If local companies don’t get the cocoa beans then the processing plants become useless,” he noted. 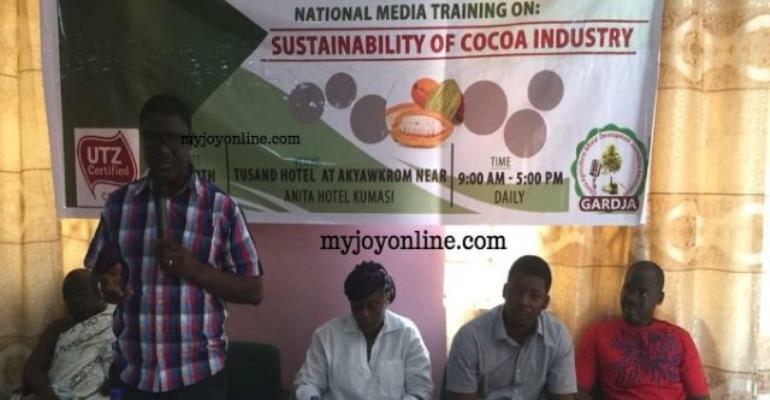 The Director of World Cocoa Foundation was speaking to journalists during a three-day training programme for members of the Ghana Agric and Rural Development Journalists Association (GARDJA) on cocoa sustainability. The objective of the training programme was to equip journalists with a good understanding of Ghana’s cocoa sector. It also trained journalists on how to tease out exciting stories on the cocoa value chain for reportage and also on gender issues in the cocoa sector. Netherlands based certification firm UTZ sponsored the training programme. UTZ representative in Ghana and Nigeria, Kwame Osei called for stakeholders in the sector to work hard to increase productivity on the farm. “We need to maximize productivity in the cocoa sector so farmers can earn a decent income. Cocoa production is on the low. We are struggling to meet our targets because farmers are not getting the support they need,” he noted. He also called for action to ease the impact of climate change on cocoa production. “We know climate changed is negatively impacting cocoa production. That is why we are encouraging the production of more trees on the cocoa fields. And we need to deal with deforestation and stop the destruction of protected forests” he noted. Chief cocoa farmer in the Bosomtwe District of the Ashanti Region Nana Mathew Darkwa called on government to help cocoa farmers deal with the terrible land tenure system in the country which is making farmers lose their cocoa farms. “Some government officials are allocating the cocoa farms to illegal miners. They are using their excavators to destroy the farms and making farmers suffer. We pray that government’s fight against illegal mining succeeds,” he said. He also called for better policies to encourage young people to get involved in cocoa production as a sure way to sustain the industry. President of GARDJA Richmond Frimpong expressed confidence the training programme will go a long way to help journalists report appropriately on the industry and help sustain production.